After three years in prison, Shadow has done his time. But as the time until his release ticks away, he can feel a storm brewing. Two days before he gets out, his wife Laura dies in a mysterious car crash, in adulterous circumstances. Dazed, Shadow travels home, only to encounter the bizarre Mr Wednesday claiming to be a refugee from a distant war, a former god and the king of America. Together they embark on a very strange journey across the States, along the way solving the murders which have occurred every winter in one small American town. But the storm is about to break…Disturbing, gripping and profoundly strange, Gaiman’s epic novel sees him on the road to the heart of America. Even before Shadow is released from prison, he knows something is wrong. He can feel a storm coming. There’s a charge in the air, the taste of electricity on the wind. Only, it’s not an ordinary storm. It’s a storm unlike anyone alive has ever seen, a supernatural turmoil that will pit industry and science against superstition and religion in a final, bloody confrontation. Shadow is soon caught up in the brewing conflict by an encounter with Mr. Wednesday. Wednesday seems to know something about Shadow that even Shadow himself is unaware of. Wednesday claims that Shadow will have a deciding role in the war to come. The journey will be much more important than the destination, though. 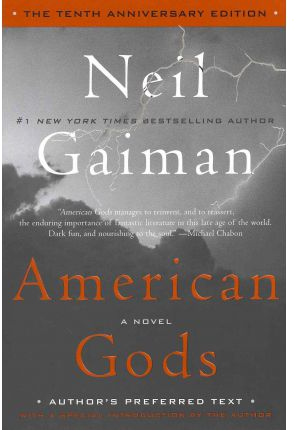 The author’s preferred text version of American Gods is a fairly long and rambling affair. It is equal parts a travel story, a heroic journey, murder mystery and supernatural thriller. It is a work of dark, sadistic, bizarre, hopeful and hopeless tones. It is jarringly American and sublimely neutral. Like many of the characters within the narrative, the story itself is two-faced, multifaceted. It is difficult to describe to another person, because that other reader will doubtless take something else away with them, and ponder on the strange half-truths uttered by the original reviewer. There is power in words, and magic. Everything our ancestors believed about words, writing and their connection to the occult is true. Gaiman is living proof of this. His story casts a spell which is not easily broken, and like magic, his story will have different significance to each reader. While the writing style is sublime, the story itself is a twisting, labyrinthine affair. If one is looking for a straight up story with a beginning, middle and end with clear progression at every page turn, then this is not the book to read. It is a journey, both in the literal and the figurative sense. It is the story of Shadow’s rediscovery of his country after his years of incarceration, and of his discovery of the shadow America that lurks just underneath the veneer of everyday life. It is also a journey of self-discovery, and of the discovery of meaning in the seemingly random events in his life. And events do occur seemingly at random. Some do happen for a reason, and some just happen. In this way, American Gods is a much better reflection of life than many other works that seek to tie everything off with a neat little bow. There are also segues in to “arrival stories” that punctuate Shadow’s story and tell of how some of the ancient rituals and traditions came to America, and how they are continued today. While these have little bearing on the main plot in itself, and may prove to distract some readers, they serve to provide additional flavour and atmosphere to the piece. While it is doubtless that each reader’s mileage will vary with the unfolding of this tale – as Gaiman himself acknowledges in his introduction – it is a trip that is worth at least starting, a meal that should be sampled at least. In fact, a divisive piece of writing may have more merit than one that is universally acclaimed or derided because it can work towards facilitating better communication with and understanding of the involved parties. While American Gods is difficult to laude unilaterally; some may find it too long, too twisting, too American, too dark, to unbelievable, etc, etc – it is none the less a fantastic piece. If for nothing else, it is worth picking up to see how Gaiman weaves his words and sentences. You may love American Gods or you may loathe it, but with any luck at all, you will read it.